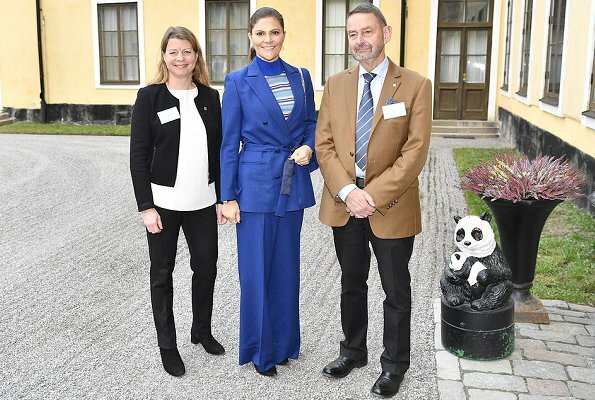 On November 22, 2018, Crown Princess Victoria of Sweden attended WWF's Baltic Sea Lunch about the Baltic NOW 22 initiative at Ulriksdal Palace. 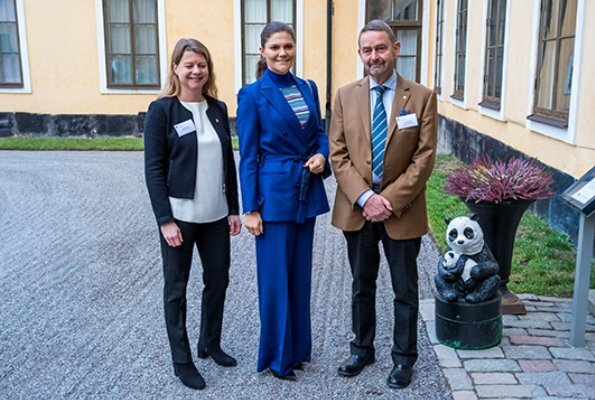 Världsnaturfonden WWF was established in 1971 with the purpose of making financial contribution to the international operations of WWF and in addition, setting aside funds for Swedish research, education and practical nature conservation activities. The Foundation has a Council of approximately 50 people and King Carl XVI Gustaf is the president of the Council. 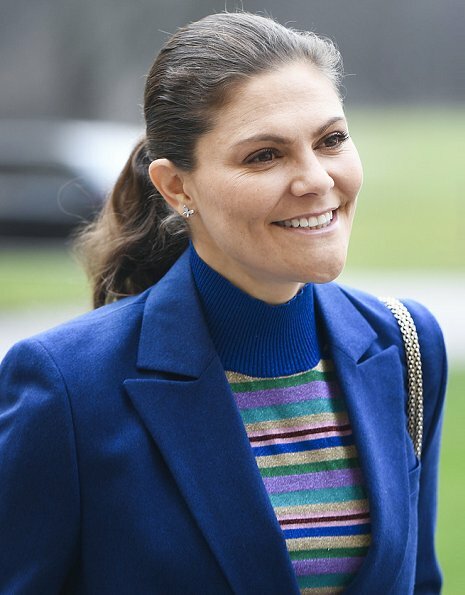 Crown Princess Victoria is a member of the Council. 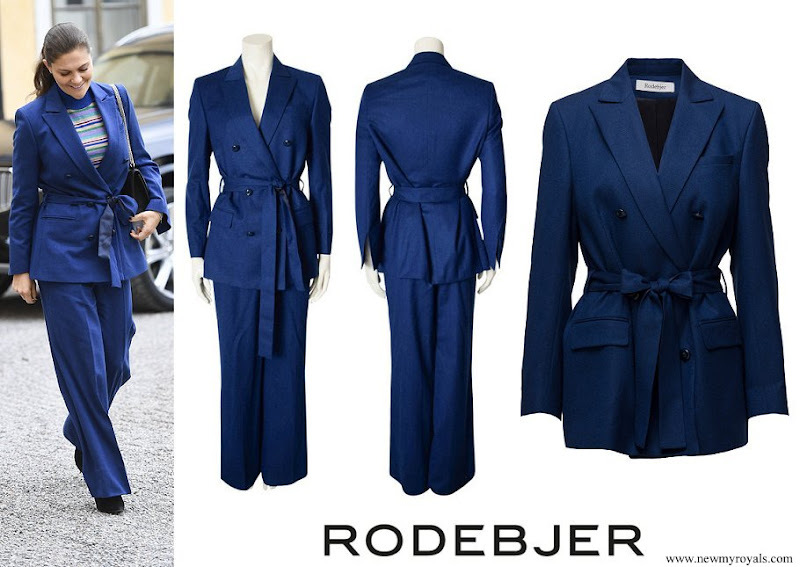 (The Crown Princess wore a jacket and trousers by RODEJBER). Wow the royal blue is beautiful. The jacket is great but I think the outfit as a whole would have been better with a different top and thinner pants. I'm not generally a fan of horizontal stripes or belted jackets (possibly because I am no longer thin enough to wear them ☹️) but I do like this outfit. I also like the long wide trousers, though I know many disagree with me. It's a style I am delighted to see return after years of skinny jeans. The suit is a gorgeous colour and Victoria looks great in it. The sweater is hideous. But the suit is wonderful. Nice to see Victoria again. I like the suit but not the top. This is a nice color for her. Omg...... she is very pretty and dignified but here unfortunately looks like afashion enthusiast home maker from the 80s. Victoria should stick with more fitted suits. This just looks sloppy. I really wish she'd hire a stylist, or a new one if she has one already. She makes so many choices that are wrong for her. Not a great look for Victoria. The jacket makes her look top heavy and I don’t think the color works for her, she looks washed out. Maybe more makeup would have helped. This is a miss for me. I don't understand what's happened to Victoria's style. A few years ago, her clothing looked way better. Pretty, well fitting, feminine. Now she looks quite masculine. I like her wearing colours and wearing different things. But contrary to the pale blue suit she had yesterday, I don´t like this one today. It looks much more sloppy, doesn´t fit as well as the other, the tied belt has no structure (instead more of a morning robe vibe), and the trousers are indeed too wide (yesterday´s were wide, these are too wide). Overall, this look much less polished. And the quirky top as well as the colour (work overall blue) only push it further into casual territory. 8:59PM - Oh yeah, the 1980s. I have a Sears catalogue from 1976, and her ensemble would fit right in there as well (except 1976 was all polyester). But I suppose it's keeping Victoria warm. 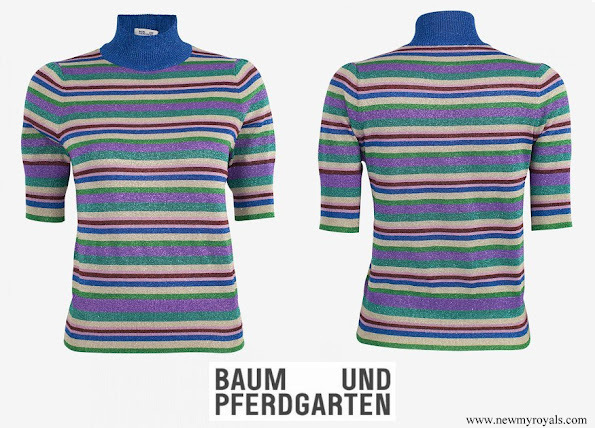 I think the sweater is definitely "70s", and it should have stayed there. The jacket and pants are timelessly ugly. I just wish she would stop wearing suits with wide those trousers. When I see her in one of these I often concentrate only on her beautiful smile and don't look her outfit twice. Il n’y a pas plus ordinaire ,pas d’allure,pantalon archi démodé . Il faut absolument abonner la princesse à un magazine de mode . Myriam je vous assure que les pantalons larges reviennent aussi dans les magazine de mode, bon on est pas obligé de les aimer, mais je crois qu'il faut juger avec flexibilité. Rodebjer est un créateur scandinave connu. I really dislike all of it. The color is nice but the shirt is 1970 Napolean Dynamite looking and the pants are 1970 Saturday Night Fever wide flared. Great colour, nice shape, really cool! Victoria sollte sich endlich von Tina Törnqvist verabschieden. can we throw away hat pullover plz?? I like the suit and it's colour. But it just does not work with this top. It is a cute top. With jeans at a playground. I don't like the top with the suit but otherwise I like it. Love the colour, prefer it to the lighter coloured suit she wore the other day. I don't understand why people keep saying that some outfits look like the 70's or 80's. These fashion styles are very on trend at the moment, it is just how it is meant to look. Sometimes i have the feeling that the ladies on this forum do not follow fashion or read magazines. Of course you have the right to like or dislike certain fashions, that's very normal but please update yourself. Agreed. These same comments are made whenever Letizia,Mary well all of them wear anything on trend. What's old is new again. I actually think that the ones who stick to the tried and true look quite dowdy at times. They're dressing too old for their age. I don't like the top with this suit but the suit is on trend and she looks hip. Because they do look like that - it doesn't necessarily mean that people don't realise what's in fashion. Sometimes looking fashionable is a good thing and sometimes it doesn't work - different tastes that's all. I FULLY agree with Iris. Franny if some royal ladies or others go for this sort of retro fashion, it is quite normal that they look like ladies in the 70's, just have to play the game. I agree however that it does not suit everyone, some ladies are better off with a sort of untemporal style (danger then appearing a bit dull, boring etc, we can also read that). In the case of this suit I think Victoria could just have bought it 1 size smaller, it could make a real difference. Just an idea, CP Victoria is for shure a sophisticated and clever and heartful lady. For this reason I think she trys to deny fashion, especially because of the concept of a Habitus (bourdieu) which she wants to suspend. Now, I know that Victoria has a long-term stylist, Tina Törnquist, and Victoria used to dress very well. But to my grief, I must say Victoria has been dressing in an unflattering way about 60-70 % of time for the past year. I cannot understand what is happening. Has the stylist lost her mind, or has Victoria mistakenly thought that since she turned forty, she must start covering herself up? To me it signals lack of self-acceptance. I also have read that Victoria has never been all that keen on clothes, but because of her very public position and her being a role model I thought she would still decide to care. Is she rebelling against her femininity, her position, fashion, or what? Or does she just want to dress comfortably? To her stylist, Tina Törnquist, I would like to say that please help -convince- Victoria to dress better! Do not allow her to continue like this! I love Victoria with all my heart, but to me she still also represents a princess and a crown princess at that! I hope to feel elevated when I see pictures of her, not feel unhappy or almost ashamed by her latest choice out outfits. This has gone on for too long now, it feels like a actual crisis! From head to toe a big fail. When will she start looking her age and not so matronly? I think this suits problem is that it is far too big. It could look nice but it don't because it is kind of drowning Victoria. The top is refreshing. Hideous outfit. Awful hairstyle. Sorry, she has no fashion sense. Surprised to hear she's got a stylist.